ENG: It is about to happen again: I would like to introduce a new look in cooperation with mytheresa.com and I am absolutely in love with it. As I have recognized this Ganni dress for the first time, I knew right away that I need this fantastic dress. Especially the shape and its small details like the button bar on the back convince me in a very particular way. In general I am a big fan of the Scandinavian label, therefore I also decided for the appropriate boots from Ganni with their high style factor and pleasant wearing comfort. In order to create a more vibrant look, I have also added my new oversized leather jacket from Miu Miu and a cashmere beanie in orange. For sure suited sunglasses and a handbag must not be missed, you know my preference for details and accessories. 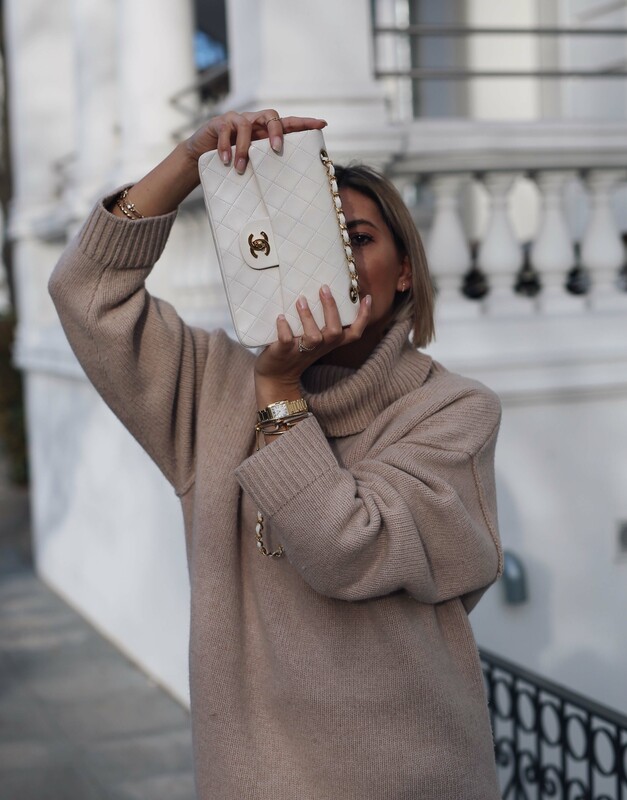 Within the luxury segment, mytheresa.com belongs to my favorite online shops due to its wide range of products and the amazing customer service. One of the most convincing arguments is the quick delivery time (within one working day) as well as the easy and straightforward menu navigation. Besides the well-known designer labels like Prada, Saint Laurent and co., I really appreciate the selection of small and young labels. Even Ganni is part of the new generation and offers a brilliant price-performance ratio, a visit on mytheresa.com is definitely worth it. I wish all of you a nice and reflective 4th advent! Do you like the combination of ‘oversized’ coat and statement belt? ENG: Good morning from Hamburg, where winter has arrived fully. Yet, I don’t want that to drag me down, because the colder it is, the more cozy knitted jumpers and oversized coats are. Do you like the all-black look? ENG: An exciting Week is over, in which I spent most of time away from Hamburg. We started our travels on Wednesday, when we flew to Paris with Cartier, to take part in a perfume presentation. We were able to get a look at the incredibly inspiring headquarter of Cartier Fragrances and visit the Palais de Tokyo, to see the so called #OSNI 1 Cube, which is a small glass complex, made after the image of a dice. Only two people are allowed to step inside the cube at a time and, walking up a small spiral staircase, you walk straight into a cloud of the new Cartier “L`Envol”. This experience is really difficult to explain, but the presentation was just sensational. Then, last Friday, we went straight to Berlin to celebrate the new Mercedes Benz X-Class. We were picked up by a shuttle and, up until then, didn’t know anything about the location, since it was a secret event with guest-list-only access. The name of the show was #60minuteswithX and created an amazing atmosphere with live acts like German musicians such as Tim Bendzko, Kool Savas, and Sido. We spent the rest of the weekend with friends and family at home in Hamburg. To Do: This week we are actually not traveling as much as usually, but we have a list of meetings and events in Hamburg. Tomorrow for example, we have an event with Edited the Label, where I will obviously take you with me through my Instagram Stories. Apart from that I am really excited for next Saturday, because Juliane (Styleshiver) and I are hosting a Blogger-Flea Market along with and at Second-Ella in the Hamburg city centre. I am going to connect the official Facebook-Event here and would love to see and meet you from 10am-2pm! ENG: Bonjour from Paris – at the moment I’m staying in the city of love with Cartier in order to learn more about the new ‚OSNI‘ perfume at the Palais de Tokyo. Nevertheless I would now like to introduce a further look for the current transition period from Hamburg, for me the perfect combination of chick and casual elements as the ideal foundation for daily use. 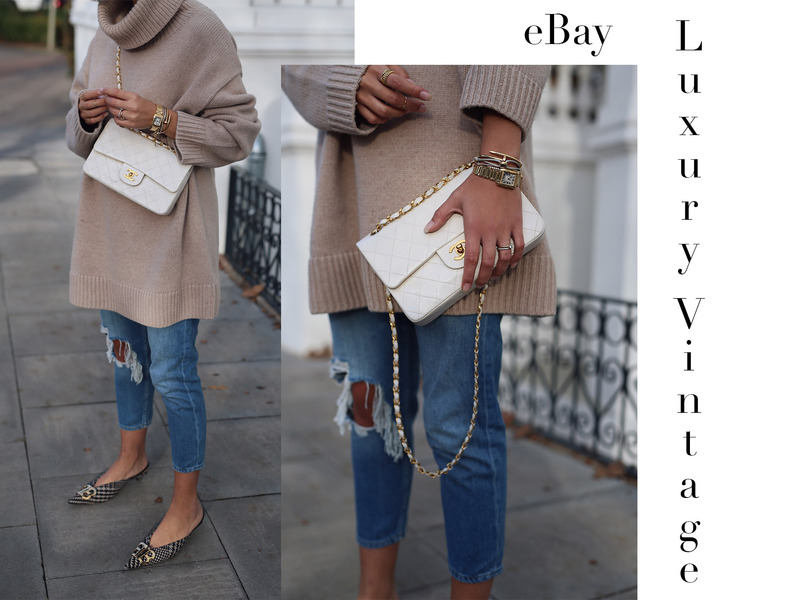 In detail it’s about a really nice and comfortable oversized knitted sweater from the latest Edited the label autumn collection. The knitted sweater has not only an amazing color but also a soft material, an appealing cut and is therefore ideally suitable for the cold season. I’ve decided for the combination with a grey colored satin skirt and my greatly loved Chanel sneaker based on their matching colors fit. Concerning the accessories I’ve consciously made my choice for black colored pieces for creating a smooth and harmonious feeling within this look. What do you think about this look? Do you like the combination with the knitted sweater? ENG: For the sake of variety I would like to introduce a street style look from Hamburg today. Even in recent past I predominantly wore summery dresses and kimonos, although I’m still a huge street style fan, when considering the diverse combining opportunities. With regard to today’s look I have decided for an one shoulder blouse from Edited the Label in combination with a destroyed jeans and my beloved Dolce & Gabbana bag. I’m continually getting so much demands concerning this bag and could wear it every day. The blouse itself can be combined in a chick and casual way, especially the exposed shoulder is definitely an eye-catcher. While the jeans ensures the casual part, the Chanel Slingback heels form the perfect outfit rounding in an elegant manner. By the way I’m also owning the one shoulder blouse in the blue/white striped version, that is also versatile and absolutely recommendable. What do you think about this look? Happy Sunday! ENG: A very eventful week is over and today I would like to use the „weekly focus“ to look back on these exciting days. Everything started with a flight to London, where we were hosted by Net-A-Porter to the Summer Sports Day at the idyllic Soho Farmhouse. For me it was definitely one of the best events in the recent past based on the perfect organization as well as the positive energy of all contact persons and participants that day. We had so much fun, therefore I will publish a separate post this week with more detailed information about the day’s procedure, my physical activities as well as my outfits that day. From London I took a direct flight to Greece in order to join a girls trip hosted by the Hell&Karrer PR agency. We were allowed to sleep in the beautiful Sani Dunes 6 stars hotel as the perfect place for peace, comfort and a relaxed atmosphere. 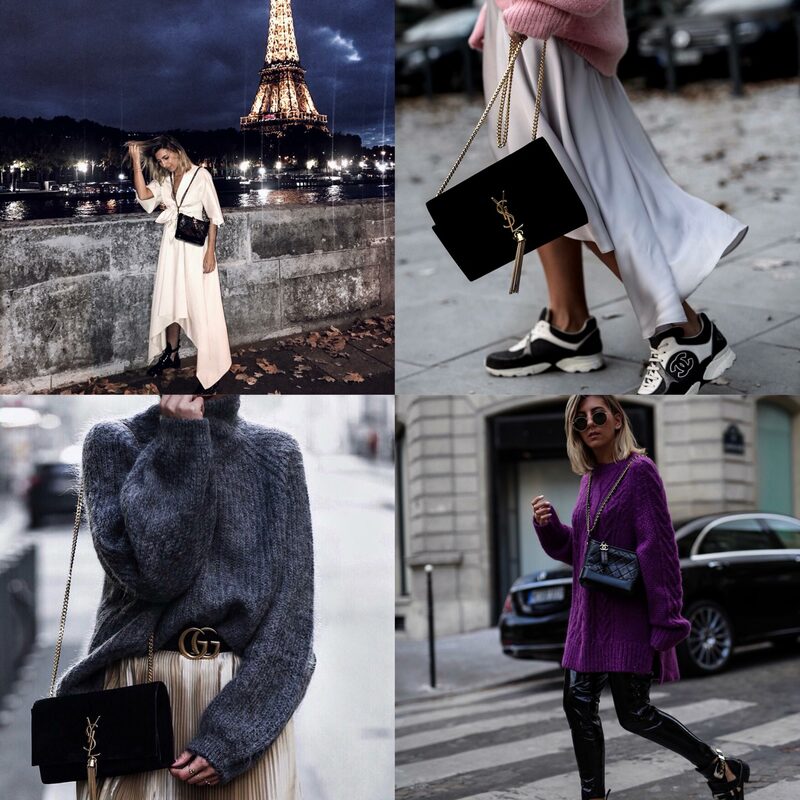 As brand partner Dior Make-Up, Juvia, Lancaster and Seafolly were on the spot, in addition to that Laura and me took over the Instyle Germany Instagram account last Friday, where we shared our looks and hotel impressions. Have you recognized the take over? Did you like our picture selection? To Do: At the moment we are staying in Berlin for participating in shows and events of this year’s Fashion Week. In collaboration with CATRICE we are sleeping in the amazing Hotel de Rome in close connection to the State Opera, it is the perfect retreat of an exciting program during the next days with fashion, lifestyle and beauty related events. As you know me, I will share the majority of my impressions via Instagram and co. with you. Since a few years I am a regular participant of the Berlin Fashion Week, that is honestly not as glamorous and pompous as those in Paris or New York but it allows continually the get-together of well-known faces within the fashion industry as well as the exciting interaction with other blogger and brands. In the end of this week I would also like to share a small review of my personal insights, impressions and outfits here in and from Berlin. New In: In London my shopping heart is exploded because I could finally get the last pair of the Dior „J‘ ADIOR“ Slingback heels, that were on my wish list for some time. In addition to that I could not resist to buy the new, dark blue MIU MIU fur slides with studs based on their high comfort and the stylish combining opportunities. From Net-A-Porter I have received this fabulous statement sunglasses from Chloé, a black colored Prada beach bag and this cute, mint green maxi dress. Last but not least I was very happy about the surprise package from Topshop in terms of a girlfriend jeans and this casual, rose colored in-between coat. ENG: Until now I associated Los Angeles as cool spot with a modern and easy lifestyle but not necessarily as nice and idyllic city. However as we drove to Santa Monica beach for a daily trip last Tuesday, it had happened to me. I am totally in love with the bright beach sections, cute cafés, huge waves, the lifestyle feeling and open-minded people, so I directly had to shoot my first look at one of the diverse lifeguard tower. The outfit’s centre is certainly the striped one shoulder top from Edited the Label, I am so addicted to the top, that I even own a second one of it in black in the meantime. The one shoulder piece is stylish and comfortable likewise, it can be used in different ways of combinations and is suited for a day on the beach or in the city at the same time. 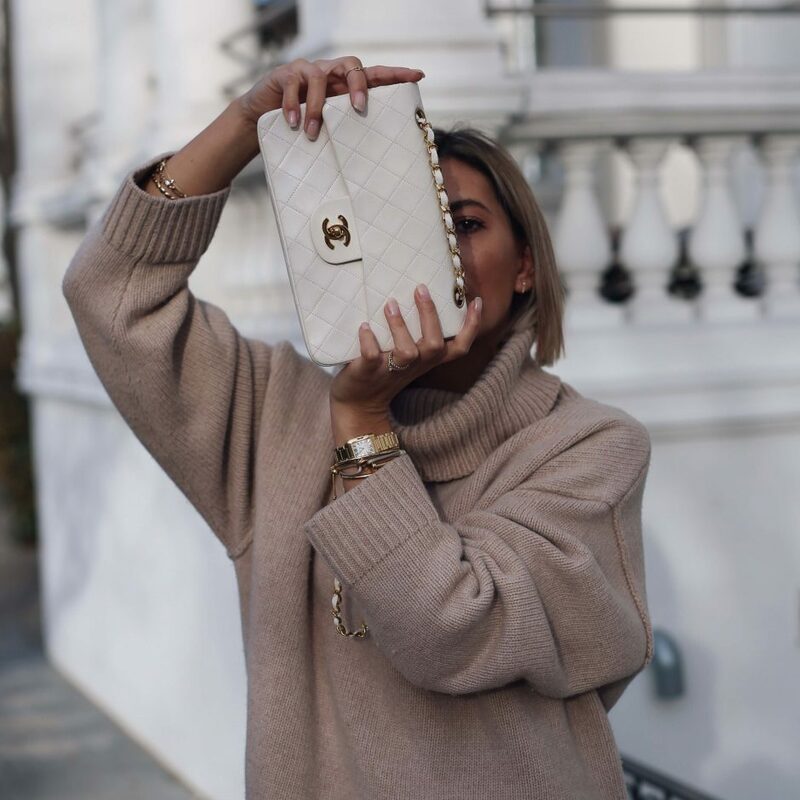 I am combining the top with a simple cropped jeans, my beloved Gucci Princetown loafer in metallic pink as well as my Chanel bag, that I already spotted several times between West Hollywood and Santa Monica. ;-) We have some plans in mind for the upcoming days and will further share our honest impressions via Instagram with you, in addition to that we have already prepared some video footage, that will be introduced very soon. What do you think about this look? Sunny greetings from California! ENG: Back in Germany I could unpack my new delivery from Kate Spade NY with great joy based on this amazing oversized coat and the pink colored Isobel bag. You know my passion for coats in general, this time I am especially addicted to the coat’s camel pattern. The trademark of the Kate Spade NY label is the love for flashy colors, graphical prints and playful designs. The luxurious bags and accessories of the brand express vitality and combine style and fun in a particular way, for me a succeeded and very recommendable mix auf luxury and pleasure. What do you think about this look? Do you know the brand Kate Spade NY?